The resources presented here provide helpful information to prospective borrowers and investors. 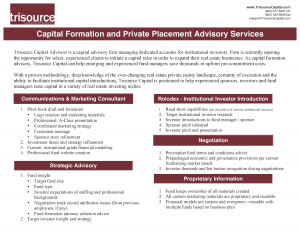 Trisource Capital can provide customized capital solutions for sponsors looking to differentiate themselves in an increasingly crowded market. Many of our commercial operators look to our firm as a trusted counterparty that structures and executes a variety of transactions across the entire capital structure. Our advisors, many of whom have spent decades in the financial industry, help real estate sponsors establish lasting, meaningful dialogues with the broadest possible array of institutional investors. Our team is comprised of investment professionals with the business expertise and capital market knowledge required to close and execute complex transactions and be a first mover in new markets and sectors. Our Capital Advisors work with you through a structured advisory process to produce the appropriate long-term strategy and investment choices for your profile. Detail of sponsor’s current business model and capital structure and an understanding of the sponsor’s goal. Develop a customized structured financial product focused on the sponsor’s market, transactional niche (stabilized, value added, or opportunistic), deal sourcing, and current management operations. Identification of meaningful institutional or retail investors. Coordination with sponsor’s legal team and other third party advisors for smooth closing and funding. Identification of investors for subsequent rounds of capital raises, if required. Learn more about our premiere capital formation, capital introduction services, real estate advisory and consulting services. 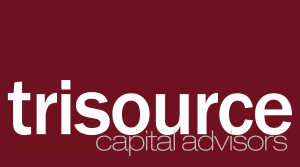 Click to go directly to the Trisource Capital Advisors site. We recognize that you may have other advisors with whom you would like us to coordinate. We seamlessly integrate with the tax counsels, accountants and other advisory professionals who work with our clients. Contact us to learn how our Capital Advisory Process can help you determine the appropriate investment choices to achieve your financial goals.